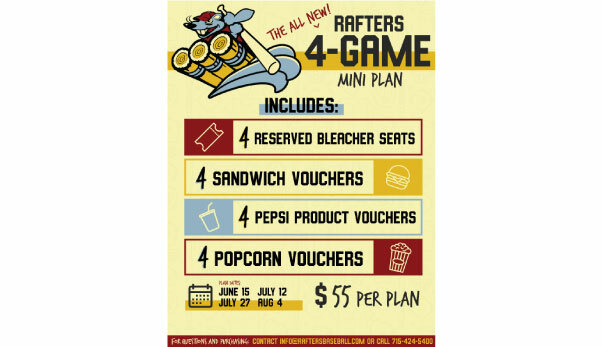 Wisconsin Rapids, WI- The Rafters announce the creation of a new ticket option called the 4-Game Mini Plan. This mini plan includes seats for 4 preselected games, as well as food and drink at each game for the price of $55 per mini plan. · A Reserved Bleacher Seat to the following Rafters games; June 15th, July 12nd, July 27th, and August 4th. · 4 Sandwich Vouchers that can be used at the Rafters concession stand at any of the 4 games. · 4 Pepsi Product Vouchers that can be redeemed at any of the 4 games. · 4 Popcorn Vouchers that can be redeemed at any of the 4 games. · A Flexible Ticket Policy that allows tickets to be exchanged for any of the 4 games. The Flexible Ticket Policy means you have the option to trade out a ticket for another one of our selected dates (tickets may only be exchanged for the 4 dates provided). · An affordable plan. This plan is only $13.75 for a ticket and food for each game. This plan is valued at $80 and it can be yours for just $55!